The Titanic model was specially designed and manufactured to honor the 100th anniversary of Titanic maiden voyage. Our designers worked on every detail to create a perfect reflection of this magnificent ship. As the original, the COBI ship has 4 chimneys, numerous decks, lifeboats, masts, and rotating turbines. Additionally, there is a possibility of installing wheels which enable you to play with the ship on the floor. The set contains 600 elements. After being built, the model is over 24,21 inches long and almost 7,87 inches high. This item is a great addition to the extended COBI Action Town collection! We bought this set from the Museum in TN for my son's birthday, however we are unable to get past the first page because of missing pieces. Can you please help? How do we get the missing pieces mailed to us? Thank you. My 9 year old son was given RMS Titanic Lego build as a Christmas present. He was very excited as is fascinated by all things Titanic. Unfortunately we were unable to go beyond first page of instructions as most of the grey blocks are missing (I must admit it did look like there would not be enough pieces to complete build when he opened box on Christmas day) and my son was left feeling very upset. Please could you advise us on our next step. Would you be able to send us the missing pieces or should we return to the shop from which it was purchased and request a refund. Where can I order them? Hi, I would love a set of instructions in pdf to store for reference. Please let me know. All instructions are available under manual tab on the main page. The large bow piece on our set is warped and does not work correctly. To my son's great disappointment we can build the titanic. Any way we can get a replacement? I was just wondering the size of the ship. It says "After being built, the model is almost 40 inches long..." but in the box it says "58 cm"? Which one is correct? We are sorry for the mistake in the description. Of course the marking on the box are correct and the model is over 22 inches(58cm) long and almost 6 inches (15cm) high. I just wanna say that I am a huge Titanic enthusiast and I received this set last year as a gift. I have never been more excited and never had more fun than I did building your Titanic model. I was very impressed with the level of detail and it now sits on my mantel where my guests can clearly see it (if I haven't already pointed it out to them haha). I would be very interested in other Olympic Class liners from your company (I.e. Britannic, Lusitania, Olympic, etc). Keep up the good work. Let's see Lego top this. Bet they won't. My grandson has put the Titanic together. He has asked if you have a display case that you sell that the Titanic can be put in. Unfortunately, we don't sell such things, only the set itself. We hope your grandson likes Titanic and will find a nice place for it! This is a great set! We seem to be missing the string that goes across the top of the ship. We pulled out all the bags and did an inventory and we have now completed the ship except for the string. Can you help us arrange how to receive that? We're sorry about this missing part in your set. Please contact us at office@cobi.pl and write what part is missing and your exact address - we'll gladly send you the spare part. Still, we hope youe enjoy building the set. how many bags should there be inside the box when you first open it? I bought this at an outlet store and im not sure if all the pieces are there, I have 2 large bags, 2 medium sized pieces that are red, loose, 2 white medium sized pieces that are loose, and a white piece that looks like it's either the front or the back of the ship. Inside the package there should be two bags with bricks, 4 plates, instruction manual and a sheet of stickers. If the set was not complete, I think you should contact the outlet where you bought it. We are really glad that you like our model and we are sorry about the missing part in your set. Please contact us at office@cobi.pl and please write there what part is missing and your exact address so that we know where we should send you the spare parts. You've designed a fabulous prototype of Titanic. 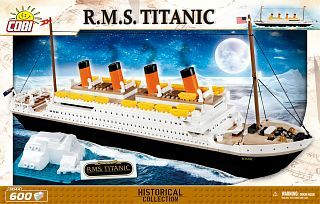 I'm 6 years old and I have a passion for lego and latest in Titanic ship story and toys. I've built with great pleasure Cobi's Titanic. All parts founded, no problem accured. Highly recommend Cobi's Titanic to everybody. We are really glad that you are a fan of our Titanic model, we appreciate all our customers' opinions. We gave our son the RMS Titanic set for Christmas, but we're missing some pieces. We're missing 4 of the orange smoke stack pieces, (2) thin 1x4 beige pieces from Step 32 and (1) thin 1x1 white piece from Step 21. Is there any way you could send us the missing pieces so we can finish putting this together? Did you get the missing pieces? Experiencing a similar issue. Thanks! Can you please send me a copy of the instructions? We want to archive them. Thank you. The instruction manual has been sent to you e-mail address. My son really enjoyed putting together the titanic, but were missing a piece. Is it possible to have it shipped? The missing piece is on page 37 of the instructions. I could take a picture of it. We're sorry about the missing part. Please write an e-mail to office@cobi.pl - you can send there a picture of the missing part, please also write your address so that we know where we shall send the part. Can you please send me a copy of the instructions? We can't seem to find them. Thank you. Where can I buy this ship? I have been looking for it since 2014. I cant find it anywhere in my country, no in Ukraine-no in Crimea. My daughter is 9-year's old and she's having a problem building this Titanic lego set. She's usually very good at putting together big, complex lego sets! At the moment, she's having trouble putting a little black box in a small space (Instruction # 7). In Instruction # 6, she's having trouble with the little black lego pieces that says x5 - she's not sure where to put them. Instructions not clear to her. Is there a video tutorial? Thank you for your message. Unfortunatelly, we do not have any additional instructions or video tutorials how to build our sets. We have not had any signs so far that the instruction isn't clear enough. In that case, I think the only way is to do it very carefully and with patience, please check the instruction piece by piece and surely you'll manage to build it. Still, we hope your daughter enjoys building Titanic. Please send greetings to her. Hello Monika, we (I and my children aged 6 to 10 years) too have had problems with the same pieces reported by Allison: "In Instruction # 6, she's having trouble with the little black lego pieces that says x5". Hi, i´ve bought the Model Titanic 1914 on Ebay. First of all, it is a great Model so far, but.... 2 Peaces are missing. The front, the Bow and the plate above. My son is so sad, is there a chance to reorder this 2 peaces? PS. sry for my bad english. Thank you for the message. The information and the missing pieces were sent to you 02.08.2016. Hello, I bought titanic model boat it was really good fun to build and nice to look at. but soon the Britannic's birthday it would be really fun if you could create a model boat by britannic sorry for bad english. Thank you for your opinion. The email was sent to you 02.08.2016. We are happy you are interested in COBI collections. The ship is great. High quality in general. Only the white flat plates are little bit bendy... And the bow of the ship is not as much Titanic's. Great building set, highly recommended! Thinking of buying this set, however are the instructions hard to follow? Would others recommend it? We got this set for my 8 year old she loves it so far, but there is a piece missing please contact me about replacing the missing piece. We are sorry that there are some pieces missing in your set. Please write us your address and we will be happy to send you the spare part. Also, please write which part exactly is missing. Please send directions to me. my 8 year old grandson will be devastated if We can't figure this out... I taught school for 35 years and really need more explanation. This should be fun but frustrating is now the feeling of this gift that was so wanted. The instructions for this set Titanic R.M.S. has been sent for your e-mail address. 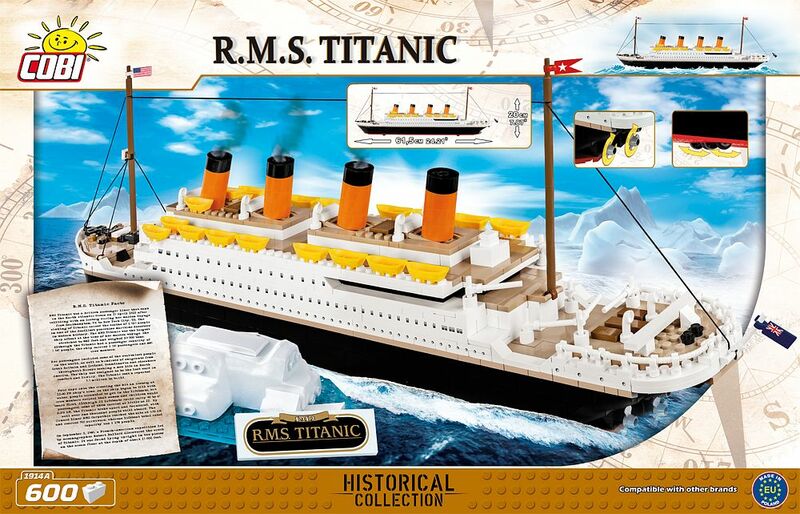 I would like to buy Titanic constructor for my 8 year old son for X-mas present, but there is no availability in your Bulgarian representative Hipoland. Haw can I order this and make happy my little boy? Thank you in advance! Milena from Sofia, Bulgaria. Thank you for your e-mail. We are very happy to hear that you are interested our COBI set. Information about our distributor in Bulgarian was sent to your e-mail address. 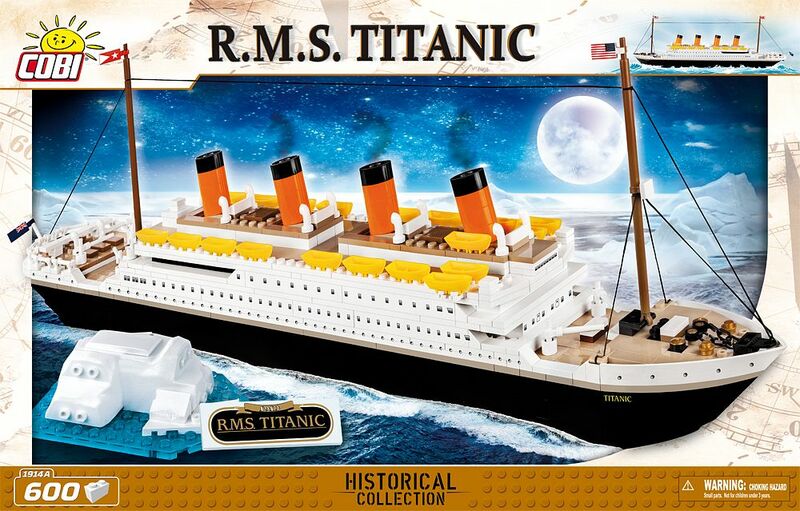 I would like to order (buy) this Titanic set to my 7 year old son. How can I order it or where from? Only from Amazon or ebay? I would thank you for your help! Judit fom Budapest, Hungary. I've just sent to your e-mail address contact to our Country Manager in Hungary. I too am finding the instructions hard to follow. My kit did not come with propellers, or the large red piece. Is it possible to order these? I'm having trouble with the empty spot on the stern, instructions 14-19, the little box that sticks up-it appears to go into that little space. Also, I have spaces between my decks. there's a little white piece that goes along the railing-instruction#20. it doesn't seem to fit. Also, I would like some instructions for where the stickers go. thank you.I am having fun with this. We are very sorry to hear that there were missing pieces in your set. Please write your address on our e-mail address office@cobi.pl and we will be pleased to send you the spare parts. Could you also send to us the pictures (from the instructions) of blocks that you think doesn't fit? Then we will try to help you to solve this problem. Dear Ms. Wegrzyn; Thank you so much for your prompt response to my e-mail, Ihave added my address as requested. I solved the problem of the little white piece and the spaces between decks. Now I have another problem: I seem to be a row short on one of the upper decks. There are 3 2x10 pieces in a u-shape then a single 8 that goes across then a 1x8 that goes on either side after that this is #27 and 28 in the instruction booklet here and#26 in my booklet. I bought my kit at a Titanic exhibition and my box says 1912, not 1913. could this make a difference? I would love to get the propellers and attachment pieces, anyway! Thanks for any ideas you may have! I am planning to buy a Titanic building kit for my son. However, from the many comments I read here, I understand that this model kit has 2 big problems: 1) Some pieces are often missing from the packages, and 2) The instruction manual is not good enough. This make me hesitate in buying this kit. My question is: What will the Cobi company do to improve these two problems? And when will it happen? If it comes to issues of missing blocks it happens very rarely. Nevertheless, our company has a complaints department, who in such situations very quickly realizes reported complaint. However, as regards the issue of the instruction to our sets the degree of difficulty is a subjective assessment of each client. Cobi company can assure you that our instructions are checked and they certainly are legible. We are very sorry to hear that your son had some problems to build the set. It is not the easiest set to build so we are very happy that he finally make it! I am in need of several parts for the bottom of the ship. We glue the projects together like a model so the younger kids don't tear them apart and lose pieces. Like in an earlier post the instructions are harder to follow than we first realized. Could you tell me how to order the parts that are glued together wrong? I am seriously confused on the instructions. Is there a video on putting this together? Hi, I´m very interesting to get this incredible titanic created by Cobi, so where can i get in the US? We are very sorry that there was a piece missing in your set. Please send us your address on our email: office@cobi.pl and we will be pleased to send you the piece by post. My son received this kit for Christmas but it was missing a red 10 X 16 piece and so he has not been able to build it. Can I order a replacement piece? I've just sent you the instructions. Can you please send me the instructions? I have lost them. I had someone put the titanic together for my grandson's birthday, but now he wants to put it together. So I have disassembled it. We are having his party today, and I thought I had all the information to put it back together. This will be a late present. Thank you so much for your help. My grandson is so fascinated about the titanic. We even went to see the attraction in Gatlinburg Tennessee. Please write your address on our email: office@cobi.pl and we will send you the instructions ASAP. Hi I Got The Set And Lost The Instructions Can Someone Send Me One ASAP I Need It For My Son Please Regards Jack?? Mein Sohn hat sich gerade die Titanic gekauft und wir haben sie nun gemeinsam aufgebaut. Leider fehlt 1 von den 3 Schiffsschrauben. Wäre es möglich diese noch zu erhalten? where can I get the decals/stickers for this titanic. we bought this and just finished assembling it on my sons 6th birthday and absolutely love it. I need a copy of the stickers. if you have a soft copy can you please send to my email addrees? My son loose a part of this beautiful boat. It's white fence part which are going around to boat. Is it possible to order a new one? We have already sent you an e-mail message on this matter. We are waiting for your reply in order to send you the replacements ASAP. We have already sent you an e-mail message on this issue. We are waiting for your reply in order to send you the missing pieces ASAP. On your e-mail address, we have sent you the instructions to follow to get the replacements from us. We hope to hear from you soon in order to send you the missing pieces ASAP. We have already sent you the Titanic PDF instruction manual for the set on your e-mail address. We hope you have received it yet. We are super excited to build, but we are having trouble with the propeller section popping off. I thought at first my son was not assembling it correctly, but the piece are not staying together!! Very frustrating!!! We are still missing the 8 pieces John listed on January 5. Please let us know how to get replacement parts. Thank you. Please send instructions for information needed to replace these pieces. Got my son this set for Christmas, lost the instructions. Is there some way to get another set? Wondering why it is dated 1913. The Titanic sank in 1912. Just wondering bc my seven year will ask. He knows his facts. 12 peg, thick rectangular piece for Step 13. Can it be mailed to us to the USA? Thank you for a reply. The model is meant to be built incrementally, starting with the piece that you make in the first step of the instructions. Everything builds in succession upon that very first structure. In each step, the directions show you which pieces to add on. Whenever a diagram shows you something that you formed previously, this structure appears gray although you built it with colored blocks. That finally answers it! the pieces turn gray in the next picture! You should change that; it's very confusing and that's why my son hasn't been able to build this and he got it for christmas. I finally decided to start looking on the internet for help. You need to have the pieces be the same color in every picture, that is how Lego does it. Very confusing! Hopefully this will help him now that I read this. Thanks. We bought this model on November 24th at the Titanic quarter in Belfast, as a Christmas present for our 8 year old daughter who is Titanic mad! I am almost finished making the ship and I am missing 2 white pieces - they are the flat 1 x10 blocks for the top deck of the ship. How can I get the missing pieces? I paid $80 for this and can't finish it! front smoke detaile on page 39 off assemble catalog.There should be two of them and we have one. I'll pay for replasement. Tell me how to get please. We made this and are missing the small "hook" piece for attaching the back smoke stack detaile on page 34 of assembly catalog. There should be two of them and we have one. I'll pay for replacement. Tell me how to get please. ja mam w domu takie same klocki. polecam! Thank you for your message and direction. We always try to take into account our customers' opinions to make our products better. The instruction manual was sent to your e-mail address. Thank you for your comment. We are very happy to hear that you finally was able to built your Titanic set! I finished her--She is beautiful!!! I love some of the design features-the hinged pieces for the funnels. so they are slightly slanted, and the way the lifeboats come together! Could you please send to us the pictures on our e-mail address office@cobi.pl of your set that you have built?Then we will try to help you to solve this problem.